Bitcoin (BTC) is still staying stuck right below the 4000 USD psychological resistance level making most of the cryptocurrency market move sideways, but there are still some impressive green gains to be found. 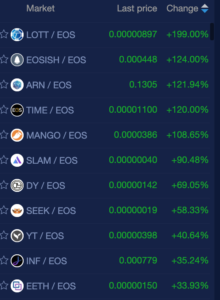 Coin360.io has Dropil (DROP) gaining 452%. 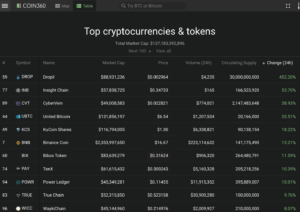 Eight coins within the top 100 market cap have double digit percentage gains: Insight Chain (INB) 53%, United Bitcoin (UBTC) 20%, KuCoin Shares (KCS) 18%, Binance (BNB) 13%, Bibox Token (BIX) 11%, TenX (PAY) 10%% and Power Ledger (POWR) 10%. 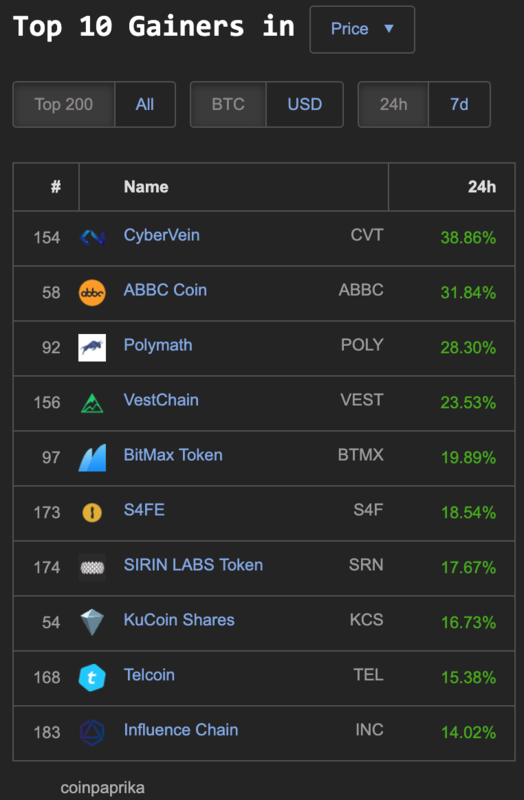 The top ten coins on Coinpaprika.com within the top 200 market cap all have double digit percentage gains: CyberVein (CVT) 38%, ABBC Coin (ABBC) 31%, Polymath (POLY) 28%, VestChain (VEST) 23%, BitMax Token (BTMX) 19%, S4FE (S4F) 18%, Sirin Labs Token (SRN) 17%, KuCoin Shares (16%) Telcoin (TEL) 15% and Influence Chain (INC) 14%. 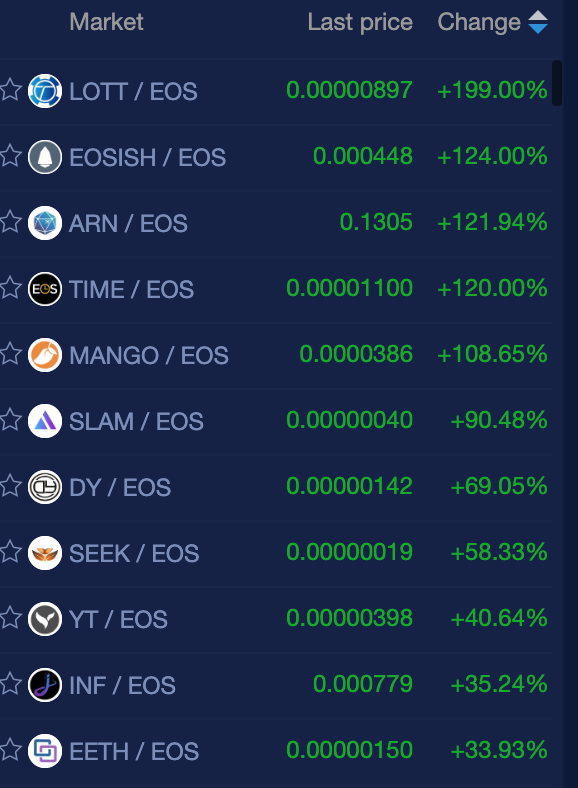 EOS tokens trading on the NewDex.io exchange lead the cryptosphere with once again with the highest number of coins gaining triple digits today: LOTT (199%), EOSISH (124%) ARN (121%), TIME (120%), MANGO (108%). 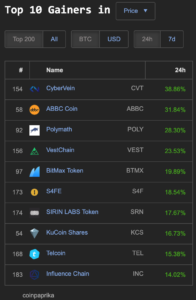 In addition there are also 16 other coins/tokens/projects gaining double digit percentages—Some of the non-gambling coins being: SEEK (58%), INF (35%), EETH (33%), VOID (33%), WIZZ (33%), ATMOS (24%), FAID (20%), and BOID (12%). 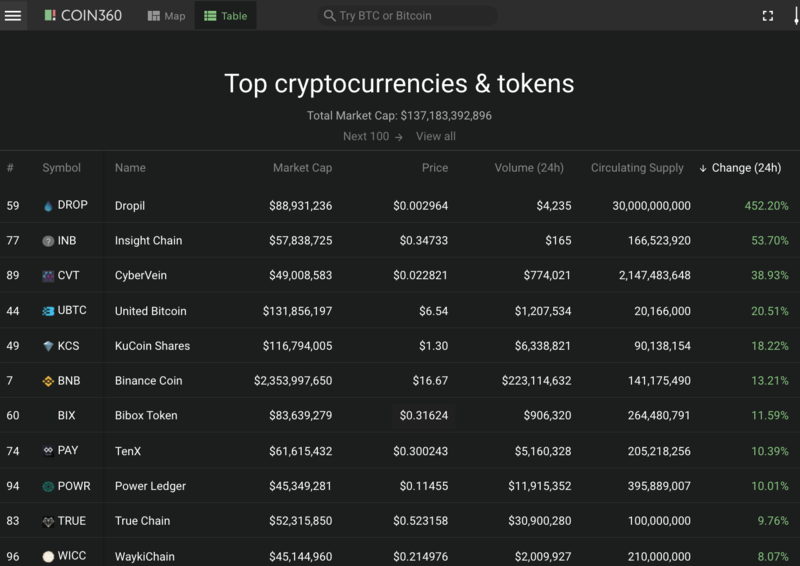 NewDex.io hosts the most cryptocurrency market leaders today. Congratulations to all those holding these coins/tokens!